During William Kurelek’s lifetime he painted Canada from coast to coast. His childhood on the Prairies, on farms in Alberta and Manitoba, gave him a love and awe for the expansiveness of skies and horizons and the power of the forces of nature over the land. He most often depicted people or their habitations as small in a large landscape, as with this finely detailed farm scene. Kurelek was very religious, which imbued his work with a sense of a mystical union with nature. 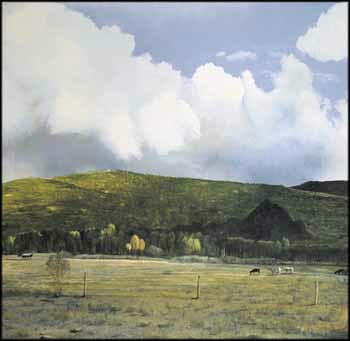 Certainly that feeling is present in this idyllic panorama with its glorious sky and heightened, almost surreal, green, in which Kurelek captured the essence of Canada’s vast beauty. This work is accompanied by a letter from the Isaacs Gallery detailing the history of the painting.